The Elswick Cycle Company was founded in the suburb of Elswick in Newcastle in 1880 and is recorded as having exhibited bicycles at the 1894 Antwerp Exhibition. However, in 1896 the chairman of the company, Thomas Davidson, moved a resolution to appoint a liquidator to voluntarily wind the company up. In 1900, the Elswick Cycles and Manufacturing Company was established in Scotland with the purpose of acquiring the business of the Elswick Cycle Company. The shareholders, who subscribed £15,000 in £1 shares, included three iron founders, a manufacturer, a merchant and a solicitor. Like many bicycle manufacturers of the period, the company began producing motorcycles in 1903 having begun with the manufacture of purpose-built frames to which engines could be attached. Elswick listed two motorcycles, a 2hp single-cylinder model and a 4hp V-twin on which one or both cylinders could be used as required. However, the make then disappeared and F. Hopper and Company acquired the Elswick assets in 1910. Hopper had started a bicycle repair business in 1880 and by 1906 he employed 400 people making bicycles. By 1912, Hopper was exporting bicycles throughout the British Empire and relaunched Elswick motorcycles that year with two models fitted with 348cc and 498cc Precision engines rated at 2.5hp and 3.75hp, respectively. A 4.25hp V-twin model was later introduced along with a single-cylinder model equipped with either a 2hp Precision engine or a Villiers 269cc engine. However, in 1913 Hopper launched an unsuccessful attempt to float the Elswick-Hopper Cycle and Motor Company and a receiver was appointed. Production ended in 1915. 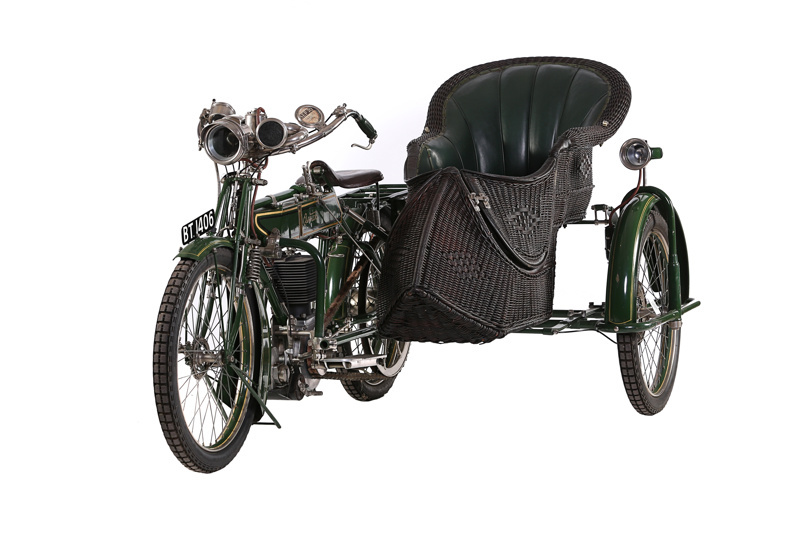 This fine 1913 example is equipped with a 550cc, single-cylinder engine, a three-speed Sturmey-Archer gearbox and an 'Art Cane' wicker sidecar. It features acetylene lighting and a bulb horn. It once formed part of a private collection belonging to Brian Frank, a well-known and widely-respected Yorkshire restorer and collector. It was restored in 1968 and recorded in the VMCC Register while in the Frank collection and was regularly ridden and displayed in shows (often at the Isle of Man TT) where it won many awards. It was purchased for the NZ Classic Motorcycles collection in Nelson, NZ via an auction in Staffordshire in April, 2008 and purchased by Transport World in May 2016.